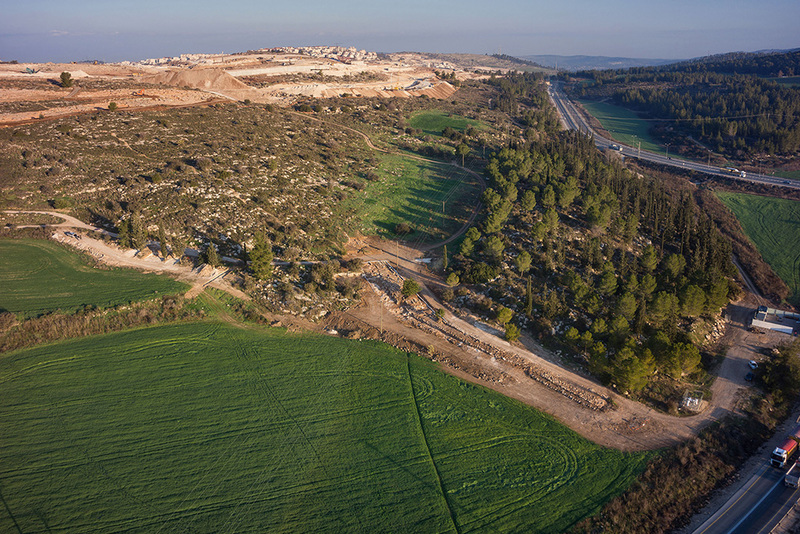 Less than 3 months ago we reported here on the discovery of a second century Roman road uncovered in the vicinity of Beit Shemesh and the Elah Valley. Recently we came down to the area from Hwy. 60 south of Bethlehem on Hwy. 375. The information in the IAA press release indicated that the newly discovered road was near Beit Natif (Netiv), but we saw no indication of it. 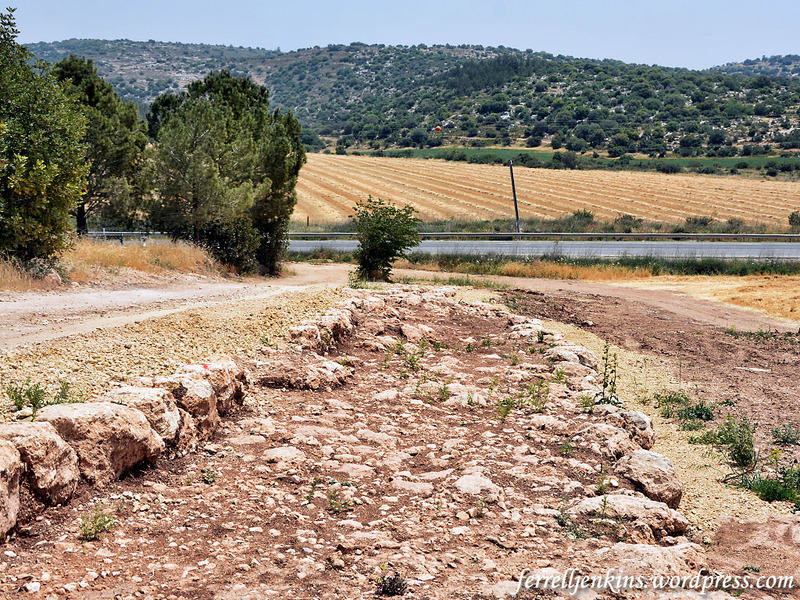 We went into the village of Beit Netiv and a gentleman pointed us back toward Bethlehem and told us that we would find a road on the left where he thought some work was being done. Following the kind gentleman’s instruction we turned successively into two roads, but neither led us to the Roman road. Finally I checked this blog and downloaded the IAA Press Release for a phone number and called the IAA office. A lady there said she did not know where the road was located but that we should give her 10 minutes and then call back for the answer. When we called back there was no answer. Hmm. Deciding to retrace our steps we headed back toward Bethlehem again. This time we had a good view to the left of the highway and saw the Roman road. The road did not come down to the modern highway 375. How would we get to it? We had passed the satellite antennas and the Etziyona Junction of Hwy. 367 going to Neve Micha’el when we saw the Roman road on the hillside coming down from the hill on which Ramat Beit Shemesh is built. Then we realized that the Work Area, which seems to be for road work, was the only place we could turn in. This time there was not as much equipment in the area and we saw an opening leading toward the fields and the road. We took that road and found parking out of the way of any workmen that might need to come through. Note Hwy. 3855 coming down to Hwy. 375. The Work Area is a short distance from the junction. I am hopeful that the annotations on this previously published aerial photo will be helpful to anyone hoping to visit this road. Aerial photograph of the road in the lower right corner of the photo. Photographic credit: the Griffin Aerial Photography Co., courtesy IAA. Annotations added. In the next photo you see the difference that a few months make in the fields. The satellite station and the turn to Hwy. 367 is a short distance to the right of this photo. Roman road looking down to Highway 375. Photo by Ferrell Jenkins. 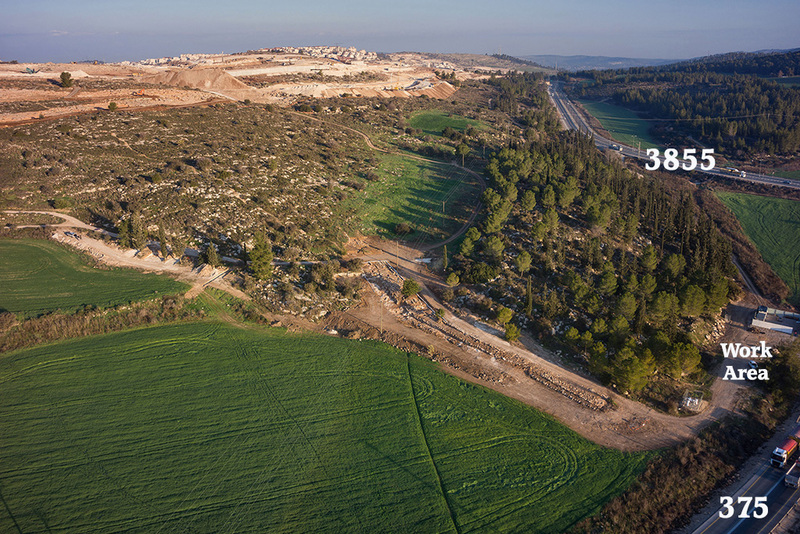 The Israel National Trail crosses the new road. The white, blue, and orange stripes mark this trail all over the country. The Israel National Trail crosses the new road. 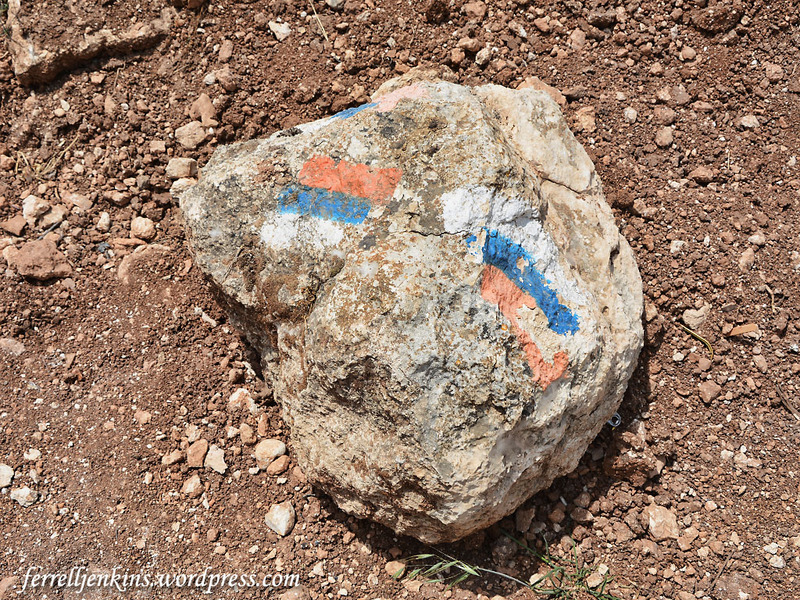 The white, blue, and orange stripes mark this trail all over the country. Photo by Ferrell Jenkins. In the short time we were there we saw two young men and three young ladies cross the 1800-year-old Roman road. The Trail continues up the field road and between the trees on the right. 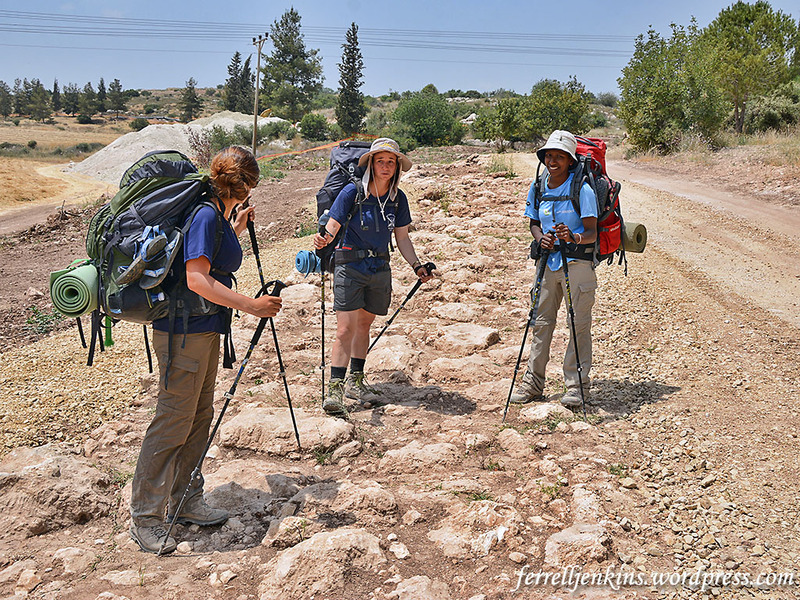 Three young ladies take a break from hiking while standing on the Roman Road. Photo by Ferrell Jenkins. 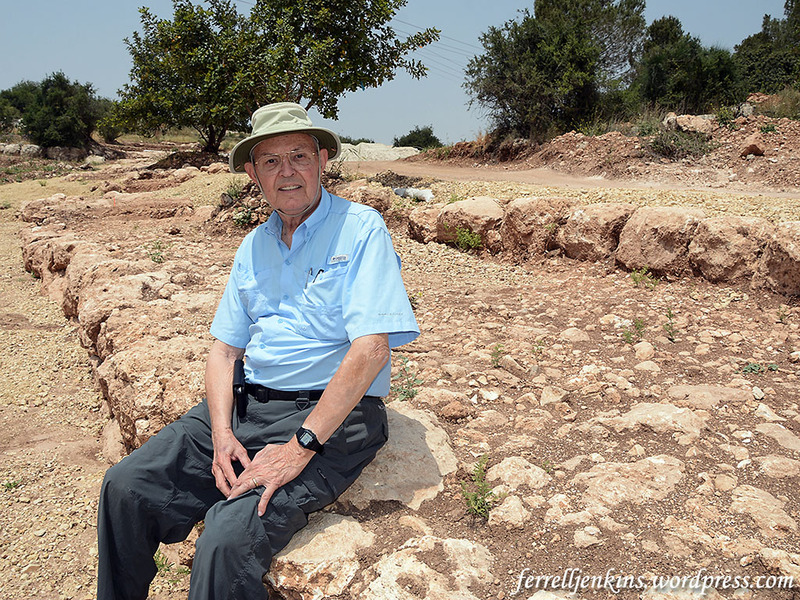 I decided to take a little break on the curb of the road which is thought by the archaeologists to have provided a way from an ancient village to connect with the Emperor’s highway which comes down from the mountain ridge of Judea. Ferrell Jenkins waiting on the curb of the Roman Road as it approaches the location of the Emperor’s Highway. Photo by Leon Mauldin. 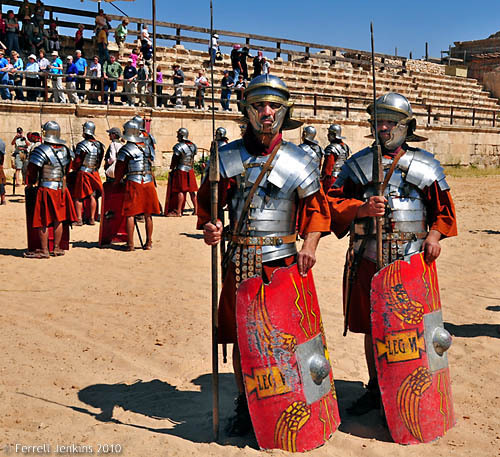 Paved, Roman imperial roads mostly date from the second century CE. They are broad, hard-surfaced, featuring curb stones, sometimes center stones, and even milestones. Such is not the case for village ways or paths. 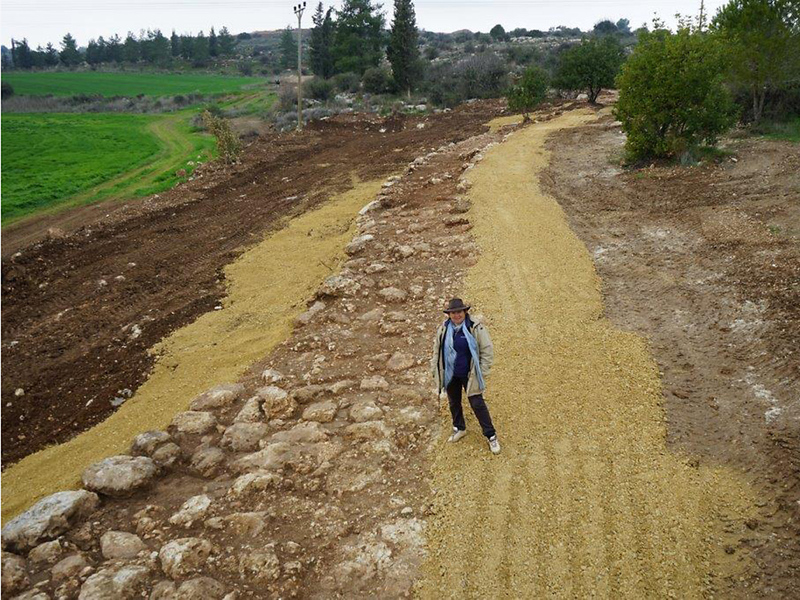 The Roman road was high on my wish list for this recent personal study trip, and I am glad to have seen it with my own eyes and walked on it with my own feet. Trust you will enjoy these photos until you have the opportunity to visit the road. Update: Reader Barry Britnell pointed out that the road I identified as Hwy. 375 (before the curve) is actually Hwy. 3855. Many thanks for the correction. I think I have made the corrections in the text for those who may be serious about locating the Roman Road. Churches and religious doctrines were not always what they are today. In fact, in New Testament times (during the first century A.D.) there were no major branches of Christendom, no denominations. There was no church organization larger than a single local church overseen by a plurality of bishops (overseers), elders, or shepherds. These terms were used interchangeably. Today, however, one encounters hundreds of denominational groups, and universal organizations. What has happened since the first century to bring about this change? It did not happen suddenly, but was a gradual process over the centuries. The Apostles of Christ warned in their sermons and letters of departures or apostasy from apostolic teaching and practice. See Acts 20:29-30, 2 Thessalonians 2:3, and 1 Timothy 4:1 as examples. Notice Paul’s warning to the elders of the church at Ephesus barely a quarter of a century after the establishment of the church in Jerusalem in A.D. 30. Emperor Constantine the Great (A.D. 307-337). Statue in Istanbul Archaeological Museum. Photo by Ferrell Jenkins. “We cannot therefore assume any strict uniformity. But the whole church spirit of the age tended towards centralization; it everywhere felt a demand for compact, solid unity; and this inward bent, amidst the surrounding dangers of persecution and heresy, carried the church irresistibly towards the episcopate…. Such a unity was offered in the bishop, who held a monarchical, or more properly a patriarchal relation to the congregation…. And in proportion as every church pressed towards a single centre, this central personage must acquire a peculiar importance and subordinate the other presbyters to itself…” (History of the Christian Church, II:142-143). “Among the city bishops the metropolitans rose above the rest, that is, the bishops of the capital cities of the provinces” (Schaff, II:153). Immediately after the discussion of the monarchal episcopate, Schaff discussed “Germs of the Papacy.” In A.D. 588, John the Faster, patriarch of Constantinople [later known as Istanbul], assumed the title of “universal bishop.” The emperor, in A.D. 606, took the title from John and conferred it upon Boniface III, bishop of Rome. This was the first pope, almost 600 years after the establishment of the New Testament church. “There was in apostolic times no distinction between elders (presbyters) and bishops such as we find from the second century onwards: the leaders of the Ephesian church are indiscriminately described as elders, bishops (i.e. superintendents) and shepherds (or pastors)” (Bruce, The Book of Acts, 415). By the fourth century enough changes had taken place that the Roman emperor Constantine called together the bishops of the churches, mostly from the eastern part of his empire, to discuss various issues that were dividing the churches. 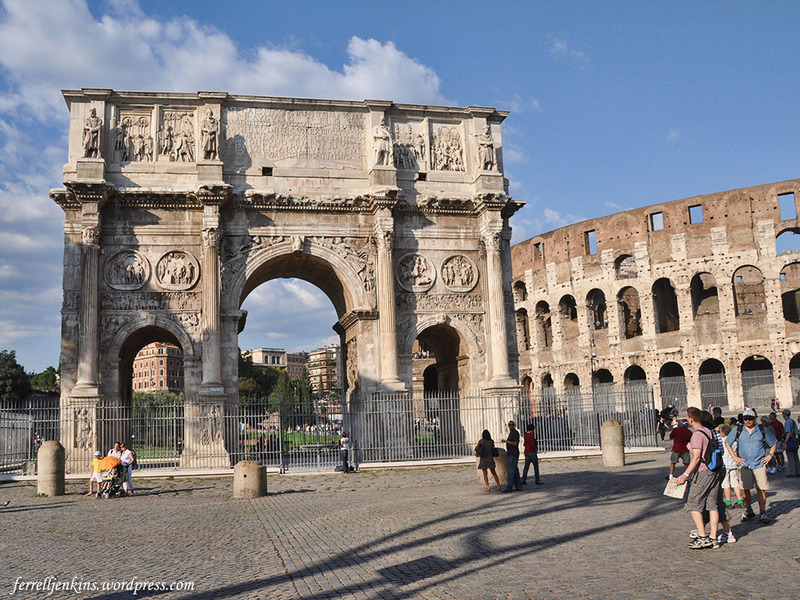 The Arch of Constantine with the Colosseum in the background. Photo by Ferrell Jenkins. This is where Iznik (ancient Nicaea or Nicea) enters the picture. In A.D. 325 the first of seven Ecumenical councils was held here. After five more councils in Constantinople, Ephesus, and Chalcedon, the seventh of these councils was held again in Nicea. In the next post we will begin our visit of Nicea. Recently I was browsing through photos made in the Archaeological Museum of Thessaloniki (Salonica, Thessalonica), Greece, in 2008. I was impressed with the images of various gods and goddesses that were known in the city in the first century A.D. There were statues and busts of Egyptian gods such as Isis, Serapis, and Harpokrates/Horus. Greek gods and goddesses such as Dionysus, Hades, Apollo, Athena, Aphrodite, Demeter, and the mother of the gods often associated with Kybele (Cybele) were known. And there were others. Athena. Archaeology Museum of Thessaloniki. Photo by Ferrell Jenkins. Immediately my mind was drawn to Paul’s commendation of the saints at Thessalonica in the middle of the first century A.D. 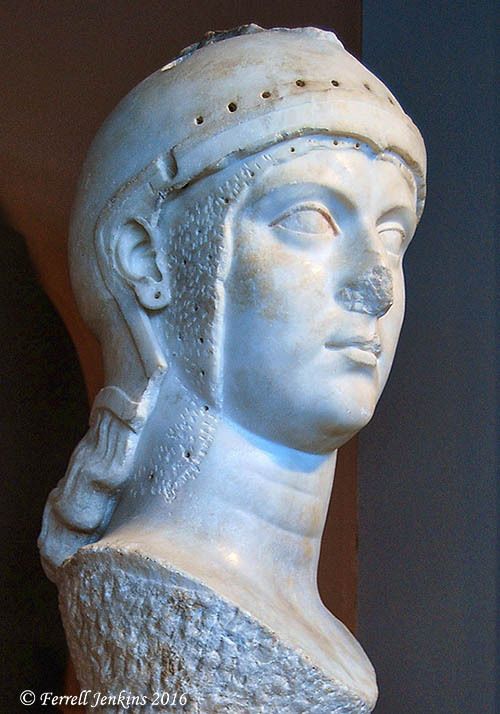 The cult of the emperor was both an instrument of imperial policy propaganda and a means for the transmission of Roman culture. The image of the emperor gives a concrete form to the abstract idea of the Empire. Whether a full-length statue or a bust, it makes his presence felt everywhere: in outdoor and indoor spaces, in fora, in villas, and in libraries. 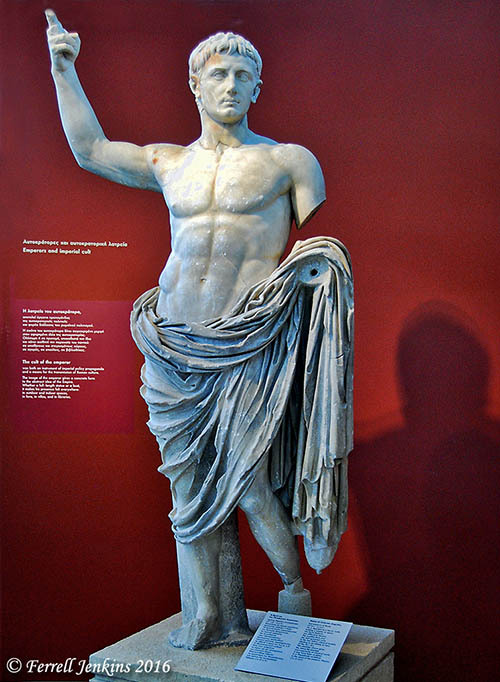 Here is a statue of Octavian Augustus, the first emperor of Rome (27 B.C. – A.D. 14). Augustus was emperor at the time of the birth of Christ (Luke 2:1). Statue of Augustus, Archaeology Museum of Thessaloniki. Photo by Ferrell Jenkins. Claudius, Vespasian, Titus, and other emperors were represented in the museum displays. An interesting temporary exhibition was about the discovery of an important archaeological site known as Kalindoia. The site is located about 48 km (30 miles) southeast of Thessalonica. 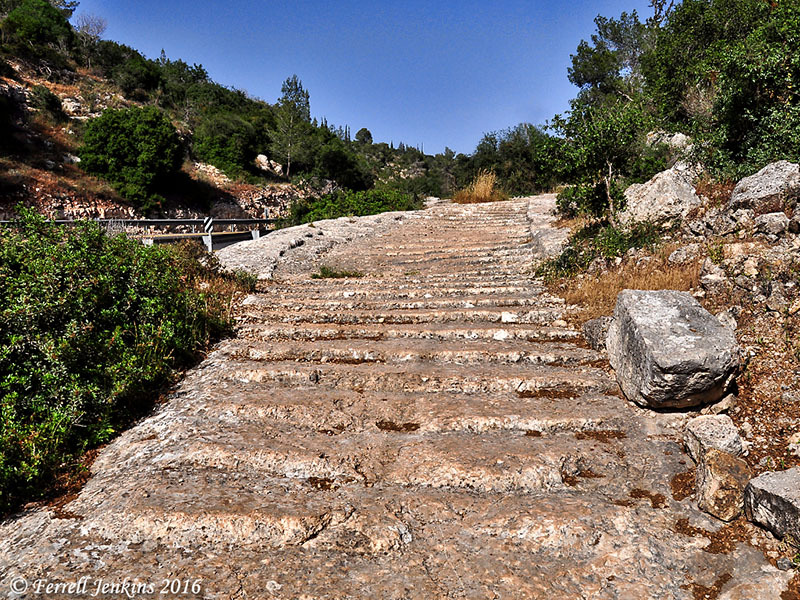 Paul traveled a few miles north of Kalindoia when he went from Philippi, via Amphipolis and Apollonia, to Thessalonica (Acts 17:1). Below is the drawing of the chamber of the imperial cult. A temple for imperial worship was located here from the 1st century B.C. to the 3rd century A.D. 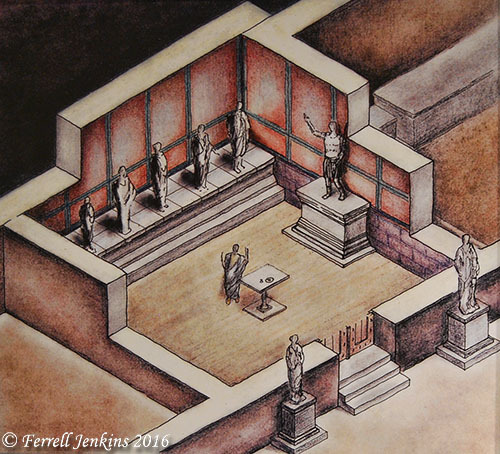 Artist conception of the chamber of the Imperial Cult. Photo by Ferrell Jenkins. The sign associated with this drawing states that there were pedestals for statues here. 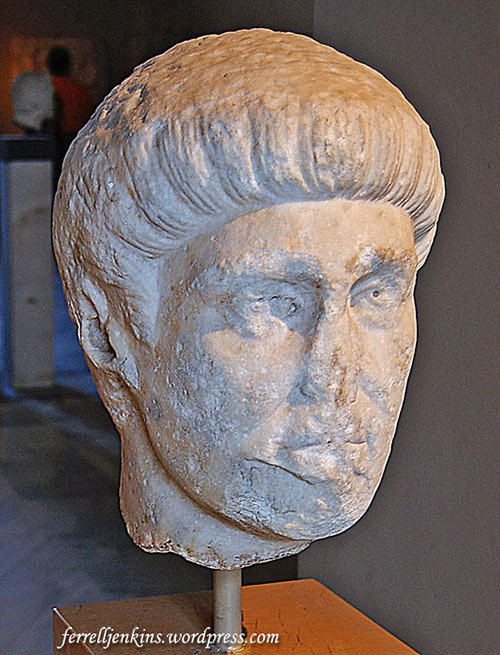 “One of them was the statue of Emperor Octavian Augustus.” The Cult of the Emperor was especially pervasive in the eastern part of the Roman Empire and may have some bearing on understanding the man of lawlessness (sin) in 2 Thessalonians 2. It is certainly helpful in understanding the background of the book of Revelation. The gospel of Christ has power to touch the hearts of men and inform them about the difference between idols made of “gold or silver or stone, an image formed by the art and imagination of man,” and the God who does not dwell in temples made by man (Acts 17:29 ESV). Many of our readers attend the annual Florida College Lectureship. The theme for the February 2-5, 2015 lectureship is “Light Shall Shine Out of Darkness. I am scheduled to present an illustrated lecture on “The Roman Imperial Cult in Palestine” Tuesday morning at 10 a.m. in Puckett Auditorium. It would be my pleasure to see some of our readers in the audience. The complete lectureship program is available here. Florida College Press has recently published two of my out-of-print books. Revised editions of Biblical Authority and The Finger of God are back on the shelf. 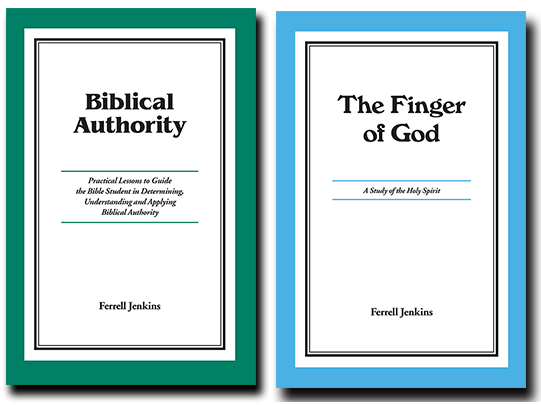 Two revised books by Ferrell Jenkins now available. The bookstore manager asked me to do a book signing Thursday between 12:30 and 1:30 p.m. Love to see you there. Several books that I have edited or have a chapter are listed if you search with my name at the Florida College Bookstore site here. View of the port of Skala from the monastery at Chora. Photo by Ferrell Jenkins. 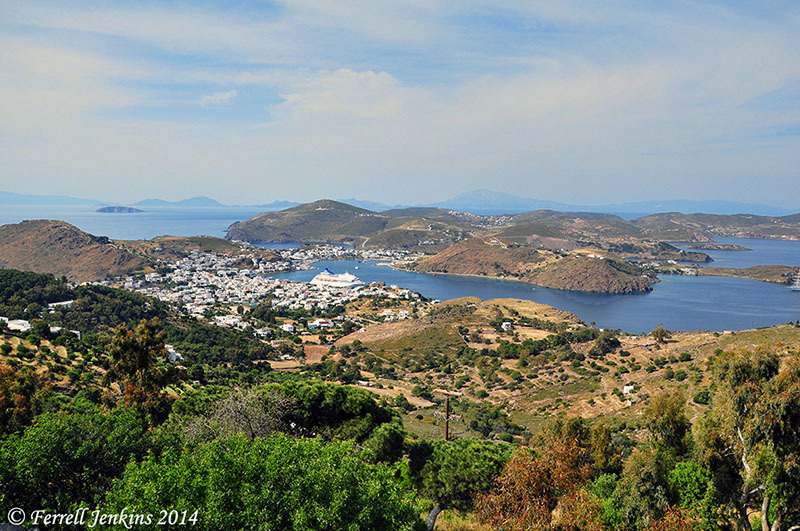 Patmos has been a part of Greece since 1947, and may be reached by boat from Piraeus, Samos, Kos, or Rhodes. The ferry from Samos takes about 2 1/2 hours, arriving at the port of Skala. Some cruise ships sail from Kusadasi, Turkey, to Patmos. 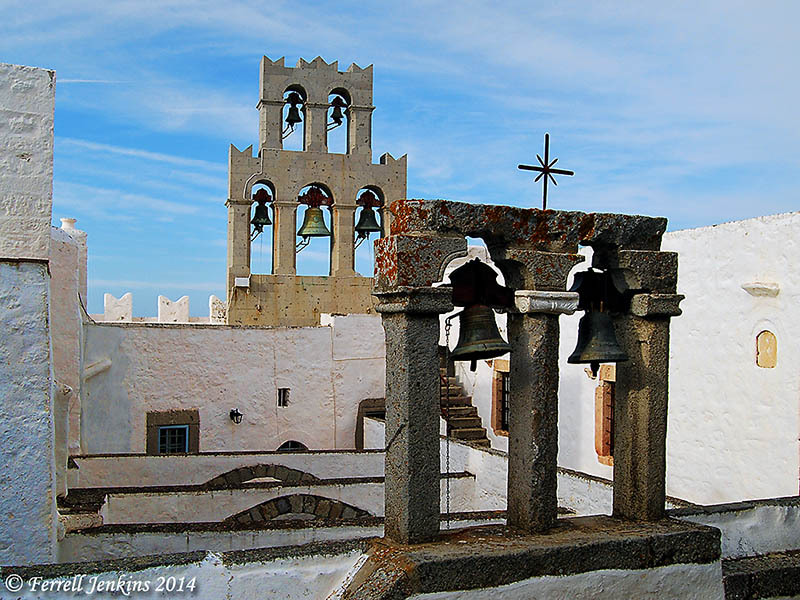 Bell tower on Monastery of St. John the Theologian at Chora. Photo by Ferrell Jenkins.